A reader, Lindsey, recently reminded me of Tu-Lu's Gluten Free Bakery in perfect time, as last weekend I headed to New York City. Formerly known as Tully's Gluten Free Bakery, this great shop recently opened in New York's East Village which again was perfect because that's where I was staying! 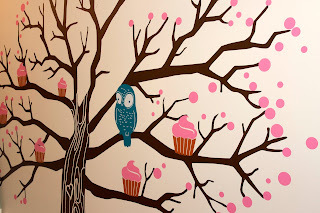 The bakery is very warm and welcoming when you walk in, greeting you with bright and airy decor and a delicious wall painting of cupcakes. The treats are neatly displayed behind glass in bright shelving units. There is also seating adequate for a few people; I can definitely envision myself snacking on Tu-Lu's treats on a warm summer day on East 11th street. When my friend Lauren and I visited we were lucky enough to meet Tully herself! She recommended us a few treats and we gladly took her up on her suggestions. I opted for the cupcake sampler (3 mini-cupcakes for $3.50) and a thin mint cookie. Whoa -- these cupcakes were awesome. We ordered two peanut butter chocolate cupcakes, a chocolate chocolate, and a vanilla chocolate. All were absolutely amazing and I really appreciated the opportunity to be able to check out different flavors. The thin mint was even better and could easily replace Girl Scouts' thin mints cookies without anybody knowing it. The texture and consistency of the cupcakes nearly matched what I remember gluten-filled cupcakes tasting like; they were soft and fluffy. Another great part: they didn't fall apart as so many gluten free products do (because of their lack of gluten to bind them). I will definitely head back to Tu-Lu's on my next New York adventure -- I have my eyes on their gluten free paninis, although I was told they do not make the bread in house. I'm also looking forward to trying more of their baked goods; if they are half as good as the ones I've already had, then they will be amazing. Looks like Babycakes has some east side competition in Manhattan! I too loved Tu-Lu's cupcakes, but wanted to share that I had a severe gluten reaction last week after eating one of Tu-Lu's paninis. I was shocked to find out that the bread they use for panini has been known to be contaminated with gluten for years, so contaminated that the bakery where it is made (Sami's) don't even call it gluten-free anymore. Over the last few months, Tu-Lu's has had multiple posts on Yelp from people who got sick from their panini, yet they continued to carry it. They seem to not understand that it is not a matter of being "sensitive"; people with Celiac disease cannot eat ANY gluten. I think it is completely irresponsibly for a bakery that advertises its gluten-free facility to carry gluten containing bread -- the same employees handle the bread and other baked goods. While I am glad that they have finally stopped making panini with this bread, carrying the bread for so long and causing illness in so many people with Celiac disease is inexcusable. Liz -- Thanks so much for this comment. I will definitely inquire about their paninis next time I visit. I'm horrified to hear about this but appreciate you notifying readers.